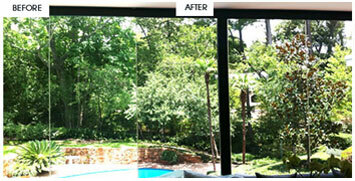 Houston Residential & Commercial Glass Tinting! Glass tinting in Houston is our specialty! Sun Pro Glass Tinting proudly offers the finest selections in transparent window film for your home window tinting in Houston and commercial window tinting in Houston. By exclusively providing Madico, Sunscape Select Film and MAC 3000 series, all of our customers' glass tinting needs can be met. These window tinting films are highly recommended by interior designers, custom home builders and architects to help maintain the integrity of your home and protect your interior furnishings. A reflective window film can keep out as much as 80% of the sun's heat and dramatically lower air conditioning costs. In winter, the same film will help retain interior heat, reducing heating costs. The return on investment can be quick and impressive. Help regulate the temperature imbalances between the sunny and shady areas of your building. No matter where the sun is, homes and offices stay cooler in summer and warmer in winter thanks to the window film. As a result, occupants are more comfortable and more productive. Click here to read testimonials from our satisfied window tinting customers in Houston Texas! Schedule your appointment for a FREE UV ray analysis or sample window tinting. Call (281) 242-0222 for all of your window tinting projects in the greater Houston area. We look forward to hearing from you!